But not parted the Sea for us – Dayenu! But not brought us through on dry land – Dayenu! But not given us the Torah – Dayenu! Here’s a conversation starter for a dry seder: Does anyone really believe the words to this song? I mean, we’ve been singing Dayenu a long time – probably since the era of the Geonim (650-1075 CE). Even families that have abridged the seder to a significant degree still consider this song essential. But consider the words as they appear on the page, and the message is less than obvious. Do we really believe that “It Would Be Good Enough for Us” (for that is the meaning of Dayenu) if G-d had redeemed us from slavery and then left us to starve in the desert? If the Sea had parted and the story ended there? If we had not been allowed to coalesce into a people, and had ultimately gone the way of the Amorites, Hittites, Canaanites, Babylonians, and others who long ago folded into history’s abyss? Of course it wouldn’t have been “good enough.” Any break in any link of the chain of those miraculous events would have signified the end of the Jewish people, and there wouldn’t be anyone around to sing Dayenu to G-d. How could that possibly be “good enough”? So maybe this passage has more to it than meets the eye? Dayenu is placed nearly halfway through the seder, after most of the storytelling has taken place and just after the recitation of the Ten Plagues. We have already recounted the brutality of slavery. We have begun to comprehend all the many miracles – and the miracles upon miracles, according to Rabbis Yossi Ha-G’lili, Eliezer, and Akiva in the Haggadah – that have brought us here today, to this moment. Soon we’ll be feasting. But first we sing this song. The themes of what it means to be a slave and what it means to be free are placed before us. And there’s a trap. We might reach this point in the seder, say to ourselves that slavery is a thing of the past, and we’re done with it. Let’s eat. · 21% of overworked Americans exhibit symptoms of clinical depression. Do you see? A girl who starves herself “just to lose a few more pounds” is still enslaved. A family that feels compelled to make a Bar Mitzvah party that much bigger or more lavish because that’s the style is enslaved. A teenager who accommodates sleep deprivation just to get fifty more points on the cursed SATs is still enslaved. Uniquely, Americanly enslaved. What’s the way out of this trap? Only this: the person who knows how to say Dayenu—what I have is, indeed, truly enough for me—is the person who is really free. I can stop the endless pursuit of acquiring, competing, accumulating more. In fact, I can do a better job at giving some of it away. Of course, there are plenty around us who are truly, desperately in need. This lesson can’t be applied outwards toward our neighbors, telling them they should be satisfied with whatever they have (as in the words of the miser in a classic Chasidic story, “If I can subsist on bread, they can surely subsist on stones!”) It only works when directed within. That’s why we sing Dayenu in our seder. Only the person who can look at his life and say, “What I have is truly what I need,” knows the taste of liberation; everything else is delusion. There’s a moment in “Right Off” that illustrates Miles’s attitude of “no mistakes.” And in this instrumental drama, there’s a spiritual lesson. You can hear the moment—Miles’s entrance after a dramatic introduction of drums, bass, and electric guitar—between 2:00 and 2:20 in the audio clip. At 1:38 the guitarist takes down the volume, and at 2:11 he modulates to B-flat to heighten the dramatic effect of Miles’s entry. However, the bass player misses the modulation, and carries on playing in E.
In other words, the two principle players are now accidentally playing in different keys. It’s a train wreck. Surely they should stop and start the take over? In the middle of this clash of tonalities, Miles decides to make his entrance. He starts by playing a D-flat, the minor third in the key of B-flat and the major sixth in the key of E. It is an ingenious choice – because the note is effective in either key. Miles than plays twelve staccato B-flat notes, phrasing them on the beat to drive the band on, and also as if to nudge [Michael] Henderson [the bass player] towards B-flat tonality. Henderson gets the message, comes into line by modulating to B-flat, and Miles carries on, giving one of the most commanding solo performances of his career. Most musicians would have regarded the point when the 2 musicians were clashing in such incompatible keys as E and B-flat as an embarrassing mistake and would have stopped the band… Very few would have considered, or have had the courage, to come in at such a moment. And even fewer would have been able to make it into a resounding success. Miles could have stopped the music, corrected the musicians, and started over. Instead, he picks the perfect note that takes the so-called mistake and makes it art. Abraham Joshua Heschel told us that our task is to construct our lives as works of art, and what Miles does is illustrative of this. On these days before Yom Kippur, we are tasked with having the courage to look honestly inward, reflecting on our choices and our deeds and their consequences. One important lesson of the Season of Teshuvah is that we don’t get to go back and erase our actions. They are done, with a ripple effect that has gone out into the world. Rosh HaShana and Yom Kippur are not spiritual erasers, blotting our sins from the Book of Life. But the Days of Awe are something else: They are opportunities to transform those deeds and shape them. Every living soul is a work-in-progress. It’s been said: No one can make a brand-new start, but anyone can make a brand-new ending. Think about it this way: Teshuvah is one of 613 Mitzvot. That means if a person is perfect and has not sinned – then she can only do 612 of them! The rest of us get the upper hand! To take what we’ve damaged and mangled and turn it into art: that’s the trick. Miles knew it; so did the Talmud. Maybe this year Yom Kippur can spur more of us in that direction. Quotes are from Paul Tingen, Miles Beyond: The Electric Explorations of Miles Davis, 1967-1991 (New York: Billboard Books, 1991), p.106. A brief thought about Teshuvah before the final Shabbat of 5778. It seems anomalous; after all, I might have thought that it was a person’s responsibility to turn or not to turn. Free will and all that. What in heaven does it mean to say that “Teshuvah” was created before the beginning of the world? I suspect that the answer lies in relationships, and that’s the reason I always share this particular midrash with couples who are getting married. To say that “Teshuvah” is a preexisting condition means that forgiveness is built-in to the fabric of a relationship. It means: before you even hurt me, I’m already prepared to forgive you. For any relationship to stand the test of time, there are some prerequisites: We know that I’m going to hurt you with occasional careless words; periodic absorption in my own problems when you need my attention; a subconsciously derived aggression or inappropriate silence when a word is needed. These things will happen, and you’re going to do the same to me. Hopefully not often; hopefully our relationship will always grow and deepen. And to say that Teshuvah preexists our relationship means that because we love each other, forgiveness and wanting to repair damages even before they happen are built-in to the relationship. This is the nature of a loving partnership. This is what it means to be a real friend, a lover, a parent, a brother or sister, or a son or daughter: I already forgive you. The midrash goes a giant step further. At this season, it is as if God says these things to each of us, too: I know you're not perfect; the potential to repair and forgive is part of the fabric of our relationship. Of course, in an era of scandalous abuses and #MeToo, we have to qualify: we’re not talking about abuse or exploitation or vicious lies here; the Teshuvah called for in those situations is much more complicated. But this is about the petty slights and daily slips that cause hurt to the most important people in our lives, the mistakes that each of us makes because we are human and thus, by definition, imperfect. Every relationship is an interaction between two different worlds (as we learn from Sanhedrin 4:5). But even before each world was created, Teshuvah was there. Otherwise, real relationship would be impossible, and each of us would be an isolated vessel, utterly alone to navigate the void. Teshuvah makes us human. The Exile of Tisha B'Av: What Are We Mourning? on Saturday evening, July 21. Exile is one of the preeminent themes of the Torah. From the outset of Genesis, Adam and Eve are exiled from the Garden of Eden. Abraham is called by God to “the land I will show you” but famine forces him to seek refuge in Egypt. Joseph is sold off to Egypt, where, at the end of his life, he makes his family promise, “When God has taken notice of you, carry up my bones from here” (Gen. 50:25). The remainder of the Torah – all of Exodus, Leviticus, Numbers, and Deuteronomy – charts Israel’s pursuit of a path back home. Jewish history works in similar cycles of dispersion and return. David and Solomon established a kingdom and a Temple in Jerusalem, but these were demolished in 586 B.C.E. and the survivors of Judah were deported eastward. They longed for Zion by the rivers of Babylon. A generation later, a remnant returned and rebuilt the kingdom and its Temple in Jerusalem. The Second Temple was destroyed by the Romans in 70 C.E., and again the Jews became a people in exile. For centuries, Jews built Diaspora communities even as stragglers returned to the Land, to pray or to die there. The advent of Zionism in the 19th century marked our most dramatic effort since the days of the Bible to return home. We have known different kinds of exile. There is political exile – distance from our physical home – and there is spiritual exile – distance from our spiritual Source. Zionism sought to put an end to the political state of exile, but spiritual exile continues to be our existential reality everywhere, including in the Land of Israel. The fast of the 9th of Av – Tisha B'Av – is devoted to reflection on what it means to live in exile. The shorthand is that it is the date when both the First and Second Temples were destroyed. But Tisha B’Av isn’t only about history, just as Pesach and Chanukah are not “only” about history. The genius of the rabbis who shaped Judaism is in the way they spiritualized history and filled it with religious meaning for subsequent generations. Why was the First Temple destroyed? Idolatry, Sexual immorality, and Bloodshed…. Because of senseless hatred (sinat chinam). Consider the theological outlook the Talmud is teaching. The First Temple stood at a time of rampant perversion and hypocrisy, so naturally (in the rabbinic mindset) it was lost. But the Second Temple stood during centuries that were recalled for Torah and adherence to mitzvot (commandments). Why would God allow it to be destroyed? The answer, says the Talmud, is because of rampant hatred that existed among the Jews – even as they were living according to the letter of the Law. Service to God in the Temple was not meant to be performed with hate in their hearts. The Temple was designed to be a place of intimacy – between God and the People, and between and among the people who gathered there. As people became estranged from one another – when they could no longer see the image of God in the face of the person opposite them – then their worship and the Temple itself became hollow. An institution based on lies and hypocrisies cannot stand. Made as trivial as a piece of tissue paper, it is as if God crumpled it up and tossed it aside – because, spiritually speaking, it was already destroyed. The assault of the Romans was just a final punctuation mark. The astonishing lesson of the Torah is that only one creation is made “in the image of God” – human beings. To treat other people with contempt or disgust or hate is to treat God’s only image that way. As a result, estrangement from one another and estrangement from God are intertwined. The Tisha B’Av fast marks a sad reality: this is the world in which we live, each in our own isolated cones with our own preoccupations and nursing our own hurts. This scenario illustrates what it means to live in exile; exile is the metaphysical sense of being alone, and it is our own doing. If we find it hard to mourn the loss of “The Temple” on Tisha B’Av, no matter; mourn for something else. Mourn for our distance from God. Mourn for our distance from each other. This piece originally appeared on reformjudaism.org on July 19, 2018. As I write, my family is stuck in our home, as the most recent nor’easter has brought down trees and power lines on our street. We spent last night by candlelight, cooking dinner in our fireplace. Shabbat is arriving imminently, so a cousin will come and pick us up around the corner and bring us to her house, and we’ll get a reprieve from the cold and dark. Much more important is the elderly couple on our block, who are being evacuated by the fire department and will be taken to stay in a local hotel until the street is cleared and the power returns, which seems to still be a few days away. And you know what? It doesn’t matter. It’s a hassle, for sure. But if nothing else, it should be a reminder—a reminder of just how darn easy and comfortable we have it here in these affluent suburbs. Not everyone, of course. We have neighbors in our town who struggle to make ends meet, people who have grave financial worries about their future. My wife and I know people well who have lived without a roof over their heads, who are not able to provide three meals a day for themselves and their families. But most of us live fairly comfortable lives here—not just the wealthiest nation in the world, but the wealthiest nation that the world has ever known. And a little inconvenience from Mother Nature should be a reminder of just how good we have it, and how there are people near and far who know real desperation. If times like this don’t help us grow into people with deeper stores of empathy and compassion, then we are truly hopeless. · 805 million people in the world who do not have enough food to eat. · 769 million people who live (or not) on less than $1.90 per day. It means that your children, whom you would do anything to protect, need not be counted among the 1 billion children of other people who are living in poverty. According to UNICEF, 22,000 die due to their poverty every day. If I sound crabby, it’s not because I haven’t showered in two days. It’s simply a profound frustration of our human nature—my own absolutely included—that forgets that what we consider to be inconveniences are so ludicrous in the grand scheme of need that really exists in the world. It’s a frustration born of living in general proximity to some of the wealthiest Zip Codes in America—and knowing that materialism, greed, and complacency co-exist (and often prevail) over empathy, generosity, and living gratefully. A destructive winter storm like this one really stinks. Some neighbors will experience lots of property damage (and insurance claims), work hours will be lost, appointments will be missed, food in the freezer will probably go bad. In order for those words not to reek of irony and hypocrisy, we have to recognize that in our inconvenience is the tiniest taste of what real suffering is like; a flavor that a staggering number of human beings around the world know intimately. If we can emerge from our inconveniences with a deeper sense of empathy, generosity, and an awareness of how unbelievably, undeservedly blessed we really are—then maybe this Passover will bring a bit of real liberation after all. “UNICEF: Committing to Child Survival: A Promise Renewed,” United Nations Interagency Group for Child Mortality Estimation (UN IGME), 2014. Tonight is the seventh light of Chanukah, which is also Rosh Chodesh: the new moon in tonight’s sky heralds the start of the new month of Tevet. I think this night holds one of the secrets of the Chanukah. Chanukah, ritually speaking, is very simple. For eight nights, starting on the 25th of Kislev, we light menorahs and place them so they can be seen by passers-by. We begin with one light and we increase incrementally until the final night, when the menorah is fully lit with eight flames. This is the key symbol of Chanukah. Chanukah always falls during these eight days around the new moon that is most closely situated to the winter solstice—that is, days with the least amount of daylight (in the northern hemisphere) and most darkness: the sun is at its most distant point from earth’s axis and the moon is at its most obscured. During that darkest time of the year—that’s precisely when we have our festival of lighting lights. And light, of course, is a pregnant symbol. It can mean justice, love, faith, peace, hope, wisdom (“enlightenment”), hidden mystical Truth. Rabbi Schneur Zalman of Lyady (1745-1812) taught that while other festivals are celebrated with symbols that are inherently physical (matzah, sukkah, shofar, etc. ), only Chanukah is celebrated with a symbol that is inherently spiritual: light. And Beit Hillel in the Talmud famously taught that in matters of holiness, our task is to always increase light, and never to decrease it (Shabbat 21b). Yet here’s the thing: during the first six nights of Chanukah, we stubbornly light the menorah—even while the world gets darker and darker. We add flames while the light of the moon keeps diminishing. But tonight there’s a change. Tonight the moon starts to emerge and wax larger. It’s as if to say that our efforts have started to pay off: The world is starting to follow our persistent lead, inclining towards light rather than darkness. Look, the world these days can seem pretty dark—no matter what darkness connotes for you. Things seem hopeless? Nations seem to be careening towards corruption and war instead of integrity and peace? People who said they care about you seem heartless? Feels like greed and materialism are winning out? I know the feeling—I’ve been there. But the aspiration of Chanukah is that hope wins out in the long term. Keep using a spark to light more lights—and the world slowly, inevitably, will start to incline towards the light. The official release of Bob Dylan’s “Gospel Shows” is bringing a lot of people back to a time when, for them, the ‘60s counterculture really died. Here was Dylan—Hebrew name, Shabtai Zissel ben Avraham—singing songs of born again Christian faith, the glories of being saved by Christ, and condemning the unbelievers of Sodom. From 1979-1981 he released a triptych of albums of these songs—Slow Train Coming, Saved, and Shot of Love—and, starting in November 1979, would only perform songs in concert that reflected his newfound covenant with God. In so doing, a lot of old fans ran for the hills. Dylan—that is, Robert Alan Zimmerman—had a Jewish upbringing in Hibbing, Minnesota. His parents were American-born children of Jewish immigrants from Eastern Europe. He trained for his bar mitzvah with Rabbi Reuben Maier in the rabbi’s apartment above a local café (his father later related that Bob showed great proficiency with Hebrew). He attended Camp Herzl, a Jewish and Zionist summer camp in Wisconsin, during his teen years. The release of these Gospel Shows (and it’s momentous; I’ve been waiting for the so-called “Bootleg Series” to get around to this era) raises again questions that dogged music fans back then: What happened to America’s greatest songwriter in the late ‘70s? How could Jewish fans listen? And as for these songs of heavenly salvation—what the hell? I’ll offer one fan’s interpretation. I’ve never met Bob Dylan, so I may be way off base. But I’ve read many biographies and interviews of the man, and more importantly, I’ve tried to pay close attention to every note of his recorded oeuvre (and many bootlegs, which are essential for understanding Dylan’s art). Interviewer: What is your real message? Bob Dylan: My real message? Keep a good head and always carry a light bulb. He tends to speak in parables, especially when he’s feeling like a trapped animal. I imagine he felt that way through much of the ‘60s, but it persisted in the subsequent decades. For instance, in 1991 he was presented with a Grammy Award for Lifetime Achievement. I suspect that Dylan recognized the Grammys for what they were: hollow trophies given out by self-congratulatory ghouls from the music business, and “lifetime achievement” is even worse—what they give you when they acknowledge that your relevance is long past, and that if you’d just hurry up and die they can start reshaping your legacy to fit their own preconceptions. So Dylan—50 years old—slithered to the podium and virtually spoke in tongues, as far as the corporate throng was concerned. He said, son, it is possible for you to become so defiled in this world that your own mother and father will abandon you. And if that happens, God will always believe in your own ability to mend your own ways. Thank you. Add to his list of accomplishments: the best awards speech ever. But in that speech (and its allusion to Psalm 27:10), which is a total fiction (Abe Zimmerman said no such thing) and a dodge (please get me off this godforsaken stage), there is also a great reveal: a desperate statement from a man “so defiled” who has been to hell and back, including the depths of alcoholism. And who believes in salvation—but only from an external force, a rock of ages. To understand Dylan’s gospel years, one has to understand that he has never been halfhearted with his art. When he commits to a guise, he dives in completely. I believe that Dylan was a true believer during these years. It proved short-lived and eventually he resumed performing non-Christian-themed songs (“Thank God,” said many old fans), but from 1979-1981 he was sincere in his devotion. In Judaism, this is called being an apikoros—as close a word to “heretic” that we have. But we have a funny relationship with our apikorsim. Some of them are some of the most important Jews in history. So in 1961 he shows up in New York completely enamored with Woody Guthrie’s Americana: work shirt, acoustic guitar, and hokey humor (to make sophisticated points about the human condition) intact. From there was an evolution to the coffee houses of Greenwich Village, hanging with Joan Baez and Dave van Ronk, and singing at the 1963 March on Washington for Martin Luther King. That’s what Dylan left behind when he started his barnburning world tour of 1966 with his electric band The Hawks. But the folkies wouldn’t let it go. Some fans embraced this loud electric rock, but the old timers booed, and slow-clapped between songs. The zenith was in Manchester, England, when, just before the band tore into “Like a Rolling Stone,” a distressed old folkie had enough. “Judas!” he howled at the Jew standing on stage. But the heckler was already a fossil. Dylan had recorded three electric albums that made him a hero to new rock counterculture. And we know what Dylan thinks about heroes, right? For all its integrity, this does show a rather perverse relationship with his audience, to say the least. In the mid-70s, his star was ascendant again. He reunited with The Band, and through 1974 performed the highest-grossing rock tour of all time. He made hugely well-received albums that reflected his mastery of the ‘70s singer-songwriter convention. By 1978 was performing a 115-date world tour with a big band, full of horns and back-up singers. But his was a tormented soul, and it was time for another sharp turn. One other thing before we approach the Gospel Years. Religion—the Bible, specifically—has always been part of Dylan’s neshama. Christopher Ricks has written an excruciating treatise on this, but I can add one or two points minus all his exegesis. Dylan knows the Bible backwards and forwards; it pops up when you least expect it. There are moments like the “slain by a cane/Cain” line in “The Lonesome Death of Hattie Carroll,” for instance. But—hands up—how many people know the title of “Rainy Day Women Nos. 12 & 35” (“everybody must get stoned!”) comes from Proverbs 27:15? 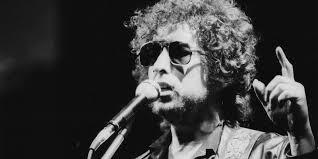 But I like to think that even in his early days, Dylan was attracted to the Old-Time Religion of America, the kind that includes periodic Great Awakenings and embraces Jonathan “Sinners in the Hands of an Angry God” Edwards, Jefferson’s Bible, Ralph Waldo Emerson, Dorothy Day, and the apocalpyticism of bluesman Blind Willie Johnson. These were all forms of a distinctly American faith. He said to the rich, "Give your money to the poor,"
So they laid Jesus Christ in his grave. They would lay Jesus Christ in his grave. Amen, selah, and tell me that those lines aren’t even more prophetic in Trump’s America than they were back in Woody’s dust bowl days? It’s not hard to imagine a young Dylan absorbing the lessons, and assimilating them into the work. With that background, I think there are three parts to understanding Dylan’s embrace of a born-again Christianity in 1979. First: As we’ve seen, it follows his pattern. When his fan base becomes enormous, he suddenly takes a sharp turn, shaking off fans who feel “betrayed” by his “heretical” embrace of something new, often the polar opposite of where he’s been. Second: Dylan is a polyglot of American music. He’s been an authentic purveyor of Woody Guthriesque Americana, protest folk, delta blues, electric rock, straight-up country, bluegrass, and, since 2011, jazz standards and the Great American Songbook. Since he’s embraced virtually every indigenous form of American music, it would be strange if he didn’t explore gospel music. Third: None of this is to say that his religious conversion, even though it was short-lived, wasn’t authentic. I believe that he believed. With an increasingly jaundiced eye he surveyed the music business of the ‘70s. Drugs and decadence were everywhere. He’d been living this life for a while. And he was living in Malibu, where friends and acquaintances were receding into their own chemical hells (see under: The Band). Furthermore, his marriage to Sara Lowndes had collapsed. They had been together since the ‘60s, and with Sara he had five kids and fled the turbulent “Judas!” years to a farmhouse in Woodstock. He wrote love songs to their family on New Morning, grieved their break-up on Blood on the Tracks, celebrated their reconciliation on Desire and its song “Sara,” and ultimately the whole thing went south. So picture the man’s state of mind: exhausted, divorced, cynical, burnt-out. Towards the end of the show someone out in the crowd… knew I wasn’t feeling too well. I think they could see that. And they threw a silver cross on the stage. Now usually I don’t pick things up in front of the stage. Once in a while I do. Sometimes I don’t. But I looked down at that cross. I said, “I gotta pick that up.” So I picked up the cross and I put it in my pocket… And I brought it backstage and I brought it with me to the next town, which was out in Arizona… I was feeling even worse than I’d felt when I was in San Diego. I said, “Well, I need something tonight.” I didn’t know what it was. I was used to all kinds of things. I said, “I need something tonight that I didn’t have before.” And I looked in my pocket and I had this cross. At 38 years old, Shabtai Zissel met Jesus. So what about the music? It’s electrifying. Listening to the Gospel Shows reminds you that, at many points through his six decades of performing, Dylan is one of the greatest performers—and yes, one of our greatest singers. The opening cut was “Slow Train,” and it is amazing to hear the singer so engaged and so committed to every syllable that comes out of his mouth. The quieter moments when he’s not preaching, but rather sharing his relationship with God—“Precious Angel,” “Pressing On,” “I Believe in You”—are as intimate a portrait of faith that any artist has ever shared. Even if, like me, you don’t share this specific vocabulary—Jesus is not my savior—there’s inspiration to be found in his inspiration. When Dylan released an album in 1983 entitled Infidels, fans and ex-fans prepared for more of the same. As it turned out, there was still plenty of apocalypse to go around: “Jokerman” has dense imagery invoking the Book of Revelations, and the refrain of “Man of Peace,” is a paraphrase of 2 Corinthians (“Sometimes Satan / comes as a man of peace.”) And there was a cover photo (taken by Sara Lowndes of all people!) of Dylan crouched on the Mount of Olives in Jerusalem. But there were respites from the fire and brimstone as well. In concert, he started backing off from the preaching. He started mixing in his older numbers. His faith seemed to have ebbed. Then something funny happened: Dylan started sounding Jewish again. He was reported to be hanging out with Lubavitcher chasidim, and performed on a televised Chabad telethon (grinning, with a kippah on his head). In September 1983, he was photographed celebrating his son Jesse’s bar mitzvah at the Western Wall. In September 1987, he brought along Tom Petty & The Heartbreakers and Roger McGuinn for concerts in Tel Aviv and Jerusalem. Was Shabtai Zissel back? Roots, man—we’re talking about Jewish roots, you want to know more? Check on Elijah the prophet. He could make rain. Isaiah the prophet, even Jeremiah, see if their brethren didn’t want to bust their brains for telling it right like it is, yeah—these are my roots, I suppose. Am I looking for them?... I ain’t looking for them in synagogues, with six-pointed Egyptian stars shining down from every window, I can tell you that much. So he’s never going to be what you want him to be. You might want him to be the old folkie that he was in his 20s; someone else might want him to sing “Forever Young” every night; I might wish he were more unequivocal about his Judaism. But the artist forges his own path, never tiring of wishing restless farewells to those who want to define him. And you gotta admit, there’s a lot of integrity in that stance. He may be an apikoros, but he’s a damn righteous one. The holiday called Shemini Atzeret (literally, “the gathering on the eighth day”) is for many people the phantom, forgotten festival in Jewish life. Even Jews who determinedly spend their week in the Sukkah might be hard-pressed to say what, exactly, that eighth day is all about. The 23rd day of the seventh month is the culmination of a three-and-half week period full of holidays: Rosh HaShana, Yom Kippur, and Sukkot have all preceded it. It arrives eight days after Sukkot begins, the final punctuation mark on this festival-rich season. But the special identity of this day is far from clear, and the Torah doesn’t make it much clearer when it discusses ancient Israel’s festivals. In Leviticus, the Atzeret sounds like the capstone to the seven days of Sukkot, and is a holiday in its own right (“you shall not work at your occupations”). In Numbers, a large numbers of sacrifices are made on each day of Sukkot; on the eighth day, a more modest offering is prescribed, indicating that the eighth day was connected to Sukkot, and yet separate and distinct from it (Numbers 29: 35-38). And in Deuteronomy, there is no mention of an eighth-day assembly after the seven days of Sukkot (Deut. 16:13-15)! Later in the Bible, we read of the enormous Sukkot celebrations that took place in Jerusalem. When King Solomon dedicated the Temple on the Sukkot holiday, Shemini Atzeret is the “one more day,” for the king (and the King of Kings) to spend together with the people of Israel; a little more time to linger together before everyone trudges home to face the approaching winter (I Kings 8:66). Consider at what a sweet image that is. Long before rabbis griped and groaned about Jews who couldn’t be bothered to show up to synagogue more than twice a year, the Bible was imagining God, surveying the Sukkot masses in Jerusalem, saying, “This time we’ve had together during the holidays has been so special—for Me! Stay just a little longer, just one day, so we can savor it just a little more.” That was Shemini Atzeret. By the generations of the Talmud, Shemini Atzeret (like many of the Torah’s holidays) had acquired some new features. It developed one overarching theme: water. Shemini Atzeret became the time when the Rabbis would pray that life-giving rains would soak the land of Israel. They (as do we) begin to insert the words “you cause the wind to blow and the rains to fall” in the second blessing of the Amidah on Shemini Atzeret. And one of the key features of the liturgy on this day is an elaborate piyyut called Geshem (“Rain”). Water is a historical worry for the dwellers of the Land of Israel. Diaspora-dwellers might find this hard to understand. In North America, rain can fall pretty much any time in the calendar year. Not so for Israel; almost all the annual rainfall comes down during a five-month rainy season from November to March. An ancient farmer, dependent on winter rains for a successful sowing season in the spring, would be very much aware if the rain was even just a few weeks late. Thus we can understand their fear and trepidation when rain had yet to arrive. An entire tractate of the Mishnah, Ta’anit, is devoted to the prayers and fasts that are prescribed for the community when the rain has failed to come. The Torah testified that the Land of Israel was dependent on the rain. By contrast, the land of Egypt did not rely on rain; rather, the irrigation of Egyptian fields came from the overflowing waters of the Nile River. The 3rd-century apocalyptic prophet Zechariah knew this; as he called upon God to punish the oppressive nations of the world with drought, he acknowledged that drought will not be much of a punishment against Egypt. Don’t worry, the prophet says; Egypt will get its own special, appropriate form of discipline! (Zechariah 14:18). Worrying about water is still the case today. A visitor to the Dead Sea cannot help but notice that this marvel is rapidly dissipating; it recedes a few dozen meters each year. The water level of the Kinneret precipitously rises and falls. And the battle over control of aquifers and water-sources is part of the realpolitik between Israel and her neighbors. Today, Israel is the world’s greatest water innovator. It has successfully deployed technology, conservation, and good management to meet the water needs of its citizens and its crops—with enough left over that it even exports water to its neighbors! (In the Boston suburbs, by contrast, it seems like every summer there is a drought and the towns rush into panic-mode, limiting the amount of water that people can use.) The themes of water scarcity and how Israel has addressed it are discussed in the recent book Let There Be Water by Seth M. Siegel. The Sages of the Talmud, as was their wont, took these themes and spiritualized them. In Babylonia, drought was less of a worry than it was in the Land of Israel. So for the Rabbis, rain became a symbol of God’s benevolence and spiritual openness. (The Beatles knew this too.) אין מים אלא תורה says the Talmud (Bava Kamma 17a); “Wherever the Torah mentions ‘water,’ read ‘Torah’ instead.” They make a comparison: Just as rain delivers physical sustenance, Torah brings spiritual sustenance. Shemini Atzeret, then, has a symbolic and deeply powerful meaning to those who are open to it. On Sukkot, we expressed our gratitude for the harvest of blessings with which we are surrounded. As the holiday concludes, we pray for life-giving waters that will sustain us and create a fertile environment for blessings yet to come. If this can happen, then we know that we can find the resources and strength to face the long cold winter ahead. Judaism recognized long ago that for Yom Kippur to accomplish all it sets out do demands a certain amount of preparation. Thus, the Ten Days of Teshuvah that commence with Rosh HaShanah are designed to spark a careful sifting through our relationships and all the parts of life that we want to redirect in the year ahead. Our tradition developed a handful of interesting customs to aid in this preparation. (A custom, or minhag, is to be differentiated from Jewish law, or halakha. They reflect the diverse local color of Jewish life as it has proliferated throughout the millennia across the globe.) Some of these customs have—mercifully!—disappeared except in certain obscure corners of the Jewish world. From this grew the customs of fasting and makkot, the act of flagellation, as a personal confession of sin… Those who do the flogging alternate with those who are flogged. Thirty-nine lashes are given, as the words of V’hu Rahum, the prayer for mercy, are recited three times very slowly by the person administering the lashes. The person who is flogged bows and recites the confession saying one word at each lashing. If specific sins come to mind, these should be mentioned quietly, below the breath. Kapparot: The most notorious Yom Kippur custom involves taking a live fowl (a rooster for a man and a hen for a woman) and swinging it over one’s head while reciting, “This is my atonement, this is my ransom, this is my substitute.” Afterwards, the chicken is slaughtered and either it or its monetary value is donated as Tzedakah. The tradition of kapparot (better, the Yiddish kappores, since it is an Ashkenazi custom) functions similarly to the Tashlich ceremony: symbolically casting one’s sins onto a third party and sending it away. There are places where the kappores themselves are given to the poor But the custom in the Rhine district, where the price of the kappora is given to the poor, is a better one, for the poor man is not ashamed to accept the money. But when the poor man is given the fowl itself, he says to himself: First this person put his sins onto this fowl, and now he humiliates me by giving it to me! The custom of kappores can still be found in some Chasidic communities. Chabad seems especially big on retaining and promoting it. In 2016, an activist group called United Poultry Concerns, trying to stem the practice, filed a lawsuit in California against Chabad of Irvine. The case was dismissed; it did not rise to California’s compelling state interest to infringe on religious liberty in this instance. Still, one can see why those concerned about animal rights are disturbed by the persistence of this custom. Mikveh: Immersion by men in a mikveh—a ritual bath for spiritual purification—is unusual but not unheard of. (Mikveh is a Mitzvah for women after their menstrual cycles, but is not commanded of men.) Immersion as a spiritual custom has had a popular reemergence in liberal communities in recent years, thanks in no small part to places like Mayyim Hayyim in Newton, MA. Daniel Sperber, the preeminent scholar of regional Jewish customs around the world, has noted some interesting aspects of the practice of immersing before Yom Kippur. In his opus Minhagei Yisrael (available abridged in English as Why Jews Do What They Do, 1999), he explains that the custom arose in medieval Germany to immerse three times before Yom Kippur. This was based on numerology: in one explanation, the phrase mikveh yisrael appears in the Bible three times; in another, the Bible refers three times (Ezekiel 36:25, Leviticus 16:19 and 16:30) to God’s purification of Israel. An alternative explanation connects the three immersions to the three appearances of the word “purify” in Leviticus 16:19 and 30. The feasting on the ninth of Tishrei [the day before Yom Kippur] helps to emphasize the solemnity and the self-affliction due the next day. The more feasting on the eve of Yom Kippur, the more pronounced the affliction on the day itself. It’s more than academic to look at the traditions that arose around preparing for Yom Kippur. Some of those customs are dead-ends for us (I won’t be joining you for lashing with makkot this week, and my own experiences with kappores largely have been nauseating, not redemptive). Some—like rediscovering the mikveh and making the meal before the fast special—readily complement our spiritual condition. What relationships are most precious to me, and how will I tend to them better in the year ahead? Whom have I hurt? Who is waiting to hear my apology? To what degree am I living up to my responsibilities—to myself, my family, my people, my world? What makes me so angry about the world that I want to scream—and what can I, in fact, do about it? How am I going to stop screwing up? If we can be honest about the questions, and start to approach the answers, then all the preparations for Yom Kippur have done their jobs.